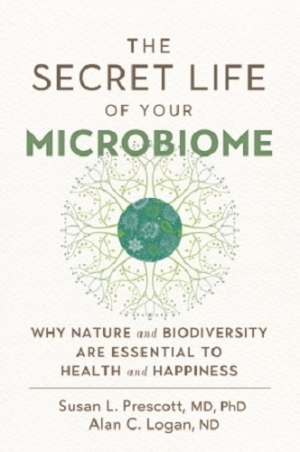 In their book The Secret Life of Your Microbiome, Susan L. Prescott and Alan C. Logan provide an extremely detailed overview of what the microbiome is, both inside and outside the body, and its importance to health. They argue that a combination of contact with nature, healthy and diverse nutrition, and a well-supported, flourishing microbiome leads to good health, and that a lack of these conditions can be linked to a host of diseases, from obesity to fibromyalgia to depression. The key to treating such disorders, they say, is in resetting the body’s microbiome, which can be done through time spent in nature, the consumption of a variety of whole foods and fermented products, and use of probiotics and supplements to encourage internal microbiome diversity. While this general notion—that lives would improve through the encouragement of healthy internal microbiomes—is championed, there isn’t much given in the way of specific guidance or real-life suggestions for general audiences. Arguments are well-thought-out and presented with plenty of scientific detail. Still, the book’s humor, tendency to rail against the concept of STEM, and aspersions cast toward bowtie-wearing pop-science experts undermine its overall delivery. The authors suggest that no one really knows what an ideal microbiome looks like, or even how to achieve it. It is perhaps refreshing, then, that their book doesn’t make bold promises to cure ailments, though more recommendations are needed.